In part 1 of this article we described Supply Chain Management 1.0 (SCM 1.0). This focuses on chain-wide, ie end-to-end, optimization of the flow of products and/or services. From ‘sand to customer’. Supply Chain Management 2.0 is described in part 2. Where SCM 1.0 is limited to the execution, SCM 2.0 also encompasses the design of supply chains. It not only makes value chains faster and more customer-friendly, like SCM 1.0. It also makes supply chains cheaper, more innovative, smarter, more robust, more agile, more sustainable and more social. To make this possible, streams of goods, services, information and knowledge are optimized. To make this happen, all supply chain partners cooperate. Part one of this article described Supply Chain Management 1.0 (SCM 1.0): the supply chain wide optimization of the flow of goods and/or services. However, today SCM encompasses more, much more. The definition of SCM - our own definition is given in part 1 of this article - broadened over the past two decades to what we will call SCM 2.0. It is not possible to give an uniform description of SCM, which always covers all aspects. This is even more true for SCM 2.0. SCM is an umbrella concept, and the amount of things that can be part of it constantly increases. SCM 1.0 mainly focused on the execution. SCM 2.0 can however also include the design of supply chains. This can even be the primary goal. We will elaborate on supply chain strategy later. However, first something has to be said about the broadening of SCM on the operational level. 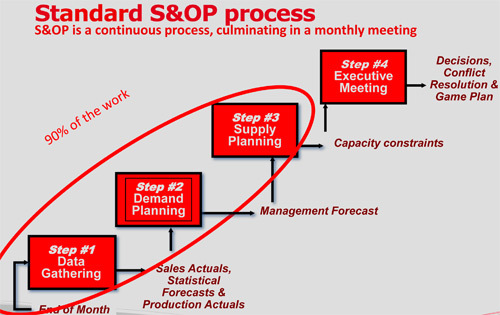 The executive tasks of SCM are the chain-wide planning, and the realization thereof. The latter means continually monitoring if things go as planned and, if not, making timely adjustments. This is called supply chain event management. You detect deviating events and you respond to these. An important aspect of supply chain planning is the alignment of activities. The best-known example of this is the alignment of sales and production, the so-called sales and operations planning (S&OP). Tanatex, a small multinational which makes chemicals for the textile industry, recently made a big progress in this area. Their vendors used to be in charge of the supply chain. This seemed fine in view of the Lean philosophy, which states that sales should dictate what goods are produced (sell one, make one). However, Lean also prescribes that the demand should be kept as stable as possible. So, unnecessary variability should be prevented. The Tanatex sellers regularly accepted orders that caused production problems, or took up capacity that otherwise could have been used for the production of more profitable items. The solution to this problem is one jointly supported planning process for production and sales, after which the sellers try to sell what they predicted to do. This sales and operations planning of Tanatex does not include ‘external’ parties in their supply chain, read: all the people involved work within Tanatex. That said this is still a telling example, because there are not many SCM cases available yet, that do include truly external links. The next step for Tanatex could be a combined procurement, operations and sales planning. As already mentioned briefly, SCM 2.0 also encompasses Supply Chain Design. Questions to be answered in this area are, for example: which parties are best suited to form value chains with, and how can the knowledge and innovative strength of these partners be used optimally, for example during the development of new products. Lean manufacturing, Quick Response Manufacturing (QRM) and the Theory of Constraints (TOC) concentrate entirely on improving the flow in value chains. SCM 2.0, on the other hand, stresses that it is also possible to improve - and sometimes even more - by innovating jointly! Supply Chain Design focuses among others on this aspect. However, it can also encompass actions aimed at corporate social responsibility and activities regarding more sustainability and therefore more recycling. The latter could mean that also a supply chain has to be designed for the return of goods: reverse logistics. For web stores, even if these do not have a sustainability agenda, this even is an essential part of their business. Although SCM 2.0 optimizes linearly, from 'sand to customer', companies that succesfully apply SCM can relatively easy make the switch to the circular economy: from sand - via the customer - back to sand. After all, with SCM you already control half of that cycle. You are already working closely with your supply chain partners, and should already be familiar with sharing costs and benefits. These aspects become even more important if you want to realize a circular business model. In the context of supply chain design, attention can also be given to supply chain risk management: what to do if an important supplier temporarily isn’t able to deliver. In addition, Supply Chain Design can include financial considerations: in which country is it best to produce regarding the tax climate there, and at which location turnover can be realized best. These so-called tax optimal supply chains attracted a lot of bad publicity in recent years, think of special ‘rulings’ by tax authorities to keep companies and work within a country. A political discussion about this seems desirable and legitimate. In most cases, however, it concerns legal constructions. If these kind of options are provided, it is logical that companies use them. Last but not least, Supply Chain Design encompasses the formulation of the strategy. What is the unique way of how your company serves its market. In fact, you should begin with this! Like any improvement method needs direction, SCM therefore starts with determining what your goal is in the long term: what is the ‘higher purpose’ that is strived for. What value should a supply chain create for which end customers, how do you distinguish yourself from the competition, and which chain partners are best suited to accomplish this. Dorel, known from their Maxi Cosi child seats, applied a method called business model generation in 2013. It uses templates, so-called canvasses, to structure the process of thinking about value propositions for (future) customers. At the time, Dorel concluded that not retail, but the end consumer should be put central. Next, it was decided to use the internet and social media to build relationships with (potential) customers, and to sell products via webstores as well as via retail chains. Finally, matching business processes were designed. This clearly demonstrates that execution followed the supply chain strategy. SCM 1.0 already needed the involvement of all operational disciplines. SCM 2.0 has become so broad that everyone in a company is touched by it. That said, it is interesting to look at the special position and the currently strongly changing role of the field of procurement. It may seem remarkable, but it was only in the last decade that purchasers realized that their primary goal is not to save costs by buying goods as cheaply as possible, but to add as much value as possible to the business. So, contributing to value creation for the end customers! That it took such a long time before this became clear, is partly due to the fact that General Motors realized huge savings through purchasing in the 1990s. As a result, the idea is persistant that saving money is the goal of purchasing. It is strange that purchasers still give cost savings such a high priority. They can achieve a lot more at the start of a purchasing process. What are you going to buy and with whom, and what do those partners add to your innovative strength? However, things are starting to change slowly. For example within the dairy coöperation FrieslandCampina, buyers increasingly get a service-providing role, to support the primary business processes. During product development, purchasers can ensure that the knowledge of potential suppliers is optimally utilized. 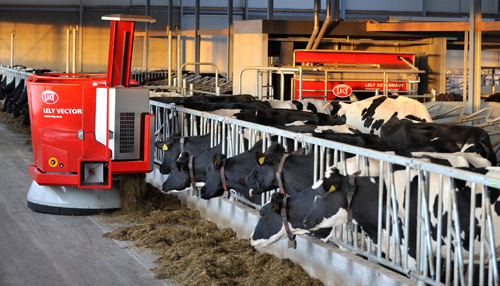 Lely, a producer of machines for the dairy farming industry in the Netherlands, already looked explicitly at this possibility in 2015. A formalized way to challenge potential suppliers to bring in their knowledge is Best Value Procurement. When this method is applied, only the most important specifications of items or services to be purchased are put on paper. It is specified what is needed, but not how this need should be filled in. Next, potential suppliers propose a contract themselves, in which they explain what their offer is, and what the Key Performance Indicators could be. Best Value Procurement is perfectly in line with a supply chain in a highly variable (VUCA) environment. Also ‘circular procurement’, aimed at innovation in a sustainable direction, can benefit from ‘solution-oriented’ or ‘consulting’ procurement, in which the suppliers think along to find solutions. The idea to invite others to contribute to product development can be extended further. Think for example of open innovation. The newest option is to let customers suggest new products or new product characterstics. This way, knowledge in the network economy, is sometimes available for free. Modern buyers can best be described as supply managers. They coordinate the influx of knowledge, materials and services into a company. Some buyers nowadays even call themselves supply chain managers. People from other disciplines, for example logistics managers, also compete for this relatively new job description. It is logical that ‘supply chain manager’ is a popular title: its all-encompassing nature makes you feel important. On the other hand this ‘all-encompassing’ nature is also the reason why you can never be supply chain manager on your own. The reason is that SCM 2.0 entails everything that contributes to create maximum value for the end customers. 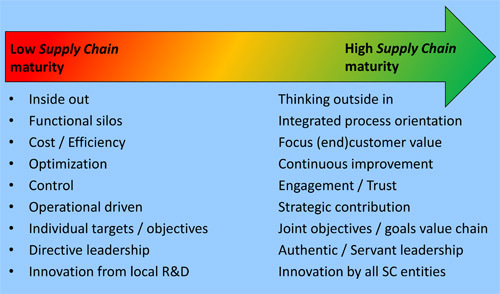 As a result, SCM 2.0 is, just as Lean, a management philosophy. Real supply chain managers hardly exist yet. SCM does not mean running your own department optimally, but working together internally and externally. Working together, aimed at synergy, brings many good things. 75% of all innovations are the result of specialisms and partners joining forces. Henk Volberda, professor of strategic management & business policy at the Erasmus University in the Netherlands, calls this social innovation. Co-innovation leads to extra value creation for the customers. SCM also encompasses the strategic coordination of supply chains: there is a vision for the long term, and you work together to achieve it. To sum up, the goal of SCM is to make supply chains faster, more customer-friendly, cheaper, more agile, more sustainable and more innovative. 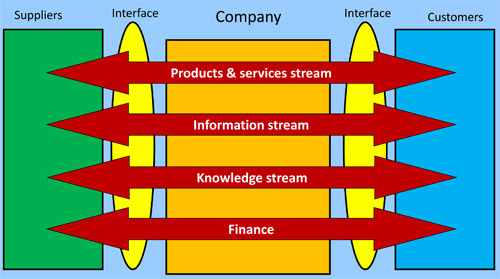 SCM 2.0 thereto manages four flows: first a flow of products and/or services, second a flow of information concerning the actual situation in the supply chain, third a flow of knowledge related to co-innovation, and fourth a flow of money. Often, the management of these flows is allocated to different people and disciplines. This is logical since, as mentioned earlier, one person can never be supply chain manager on his own. However, it should be ensured that the four flows are mutually attuned, since these are dependent on each other. Chain-wide information exchange is for example required, to steer the flow of goods end-to-end.